Mussoorie, with its green hills & varied flora & fauna, is a fascinating hill resort and a fabulous honeymoon spot . Commanding a wonderful view of extensive Himalayan snow ranges to the northeast, & glittering views of the Doon Valley, Roorkee, Saharanpur & Haridwar to the South, the town presents a fairyland atmosphere to the tourists. This hill station, situated in the foothills of the Himalaya ranges, is also known as the Queen of the Hills. 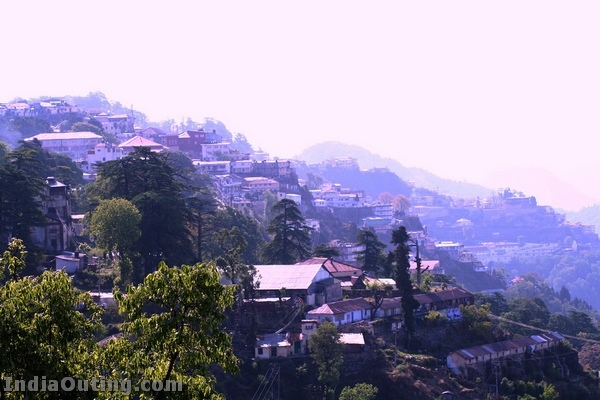 At an altitude of over 6000 ft (2000m), Mussoorie is a popular retreat from the heat of the plains. Be prepared for the cold if you come in the Winter (Dec-Feb), when you can expect freezing weather and snow. The monsoon arrives in July and stays through mid-September. Buses leave from Dehradun train station. There are two buses which go to opposite ends of the Mussoorie Mall, Library and Picture Palace. It is quite a hike from one to the other, so make sure you catch the right one. To reach Kempty Falls directly from Dehra Dun catch a bus from the Dehra Dun Railway station Hill Bus Services Section or take a taxi. One should look for buses heading for destinations like Barkot, Nainbagh, Yamunotri, and Purola. You can also take a bus to the Library end of Mussoorie and walk to the Kempty Bus stop and take a bus or taxi or a milkvan or even hitch a ride with a tourist going in that direction! 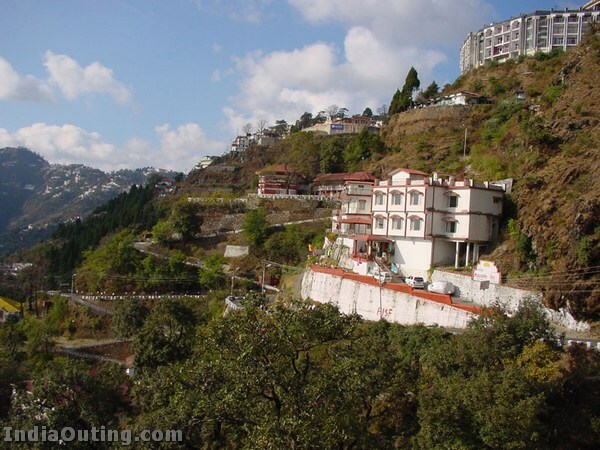 It is possible to hire a taxi for the trip up to Mussoorie. Shared or chartered taxis too are available near the same Hill Section Bus terminal and the rates are controlled by the taxi union. 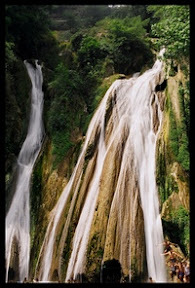 Kempty Falls – about 15 km from Mussoorie, this now over-built spot is a popular tourist destination. Catch a taxi or a bus from the Library stand. Happy Valley – a couple kilometers from the Library end of the Mall, Happy Valley is a 5,000 strong Tibetan settlement. This is a beautiful spot for a short hike. Taxis and possibly bicycle rickshaws ply this route. Lake Mist – About 5 km before Kempty falls on the Mussoorie-Kempty road is a newly developed good picnic spot with accommodation and restaurant facilities, boating is also available. Municipal garden – It is picnic spot having a beautiful garden and an artificial mini lake with paddled boating facility. It is located at a distance of 4 km by rickshaw cycles, pony or by a car and 2 km via Waverly Convent School road on foot. Mussoorie lake – A newly developed picnic spot build by City Board & Mussoorie Dehradun Development Authority, is situated at 6 km on Mussoorie-Dehradun road having a facility of pedaled boats. It offers a enchanting view of Doon Valley and nearby villages. View during Night is marvelous. 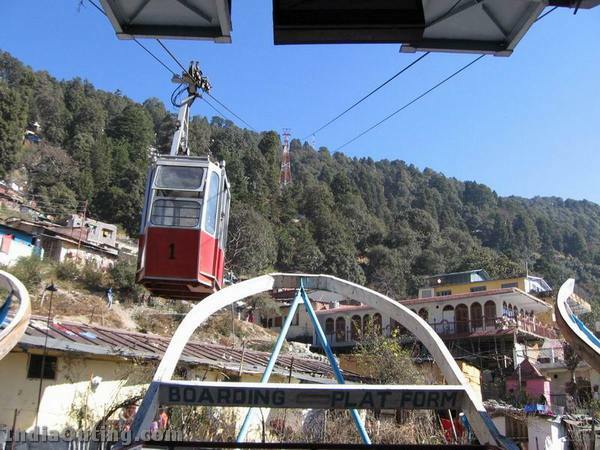 Children lodge – Highest peak of Mussoorie near Lal Tibba, it is situated at 5 km from the Tourist Office and one can go on horse back or on foot. The view of snow-clad mountains is exhilarating. 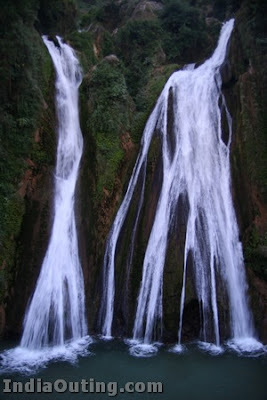 Bhatta Falls – 7 km from Mussoorie on Mussoorie-Dehradun Road near Bhatta Village. Accessible by car or bus up to Bhatta from where the fall is 3 km by foot. A fall with different ponds for bathing and water amusements, ideal place for picnic. Jharipani Fall – Located at 8.5 km from Mussoorie on Mussoorie-Jharipani road. One can go by local bus or car up to Jharipani from where the fall is about 1.5 km on foot. 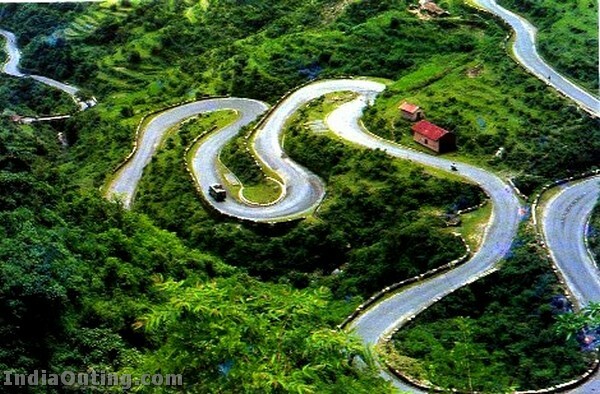 Beautiful Dhanaulti is about 24 kilometers from Mussorie. 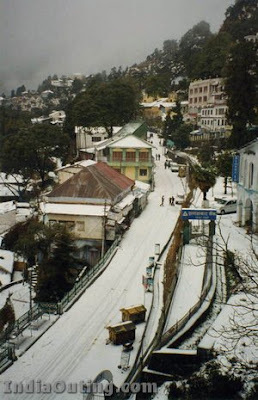 Mussoorie also had India’s largest roller skating rink. Antiques Couple of shops on the Mall road offers good antique british furniture. Wooden Handicrafts – Here you can choose from a wide variety of wooden walking sticks, hand carved jewelry boxes, magazine racks, wooden bowls & trays and various wooden show pieces. Wow…………… Its very Nice Place Yaarrrrrrrrrrrrrrrrrrrrrrrrrrr……………….. This is extremely beutiful place and I also admire the photography. so cool photos!!! aim is thank,s to this people who nice work thank you guys!!!! awesome. it’s my dream to live. i went massoorie two times , it was amazing experience . but cannot stay for long time , it is okay in summer for short time. good information about the hill station and photographs also. it”s really interesting. thank you. My home is in Dehradun – at almost the centre of the town – and this is one of the finest Pictorial Blogs with descriptions of Mussorie I have seen on the internet all these years – In fact I think it is now time to leave everything and go back to Dehradun and Mussoorie – these are towns which warm the heart all the time ..
From 1935 to 1945 I was educated at Wynberg-Allen School. Since then I have visited Mussoorie several times. It has always been a beautiful hill station. Hope it doesn’t get overpopulated in the futurs. Some wonderful pictures in this article. I studied at Waverley Convent, and left in 1974. I now live in the UK and would love ot go back sometime to see my old haunts. 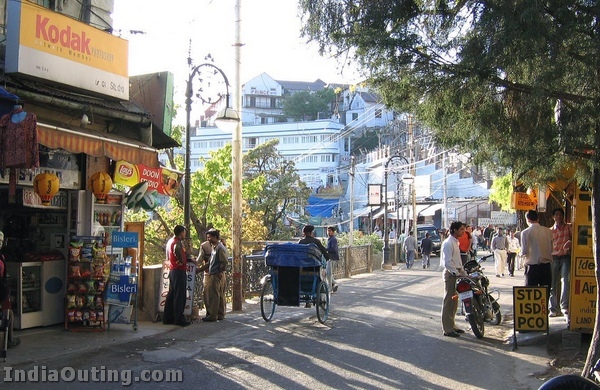 Mussoorie was/is a beautiful place and I look back at my time there with fond memories. Thanks for the fabulous pictures. I can see heaven on earth.I want to live inthis place if i get a chance. No place can be better than this paradise. Mussoorie is the best. Great memories of 60 years ago – still shining ! 6 years, including snowy winters, at Bala Hissar !! its very nice place for Honeymoon. I left Mussoorie, Oak Grove School, (Jharipani) in 1957. And have been once after that ,in 1964. Many many fond memories. It’s nostalgia time friends. Thank you immensly for the “Refreshar Course”. I am 32 and have been to mussourie almost 60 times, still i like the place very very much and want to travel there again & again. It’s a Paradise of India. Hi..me & my wife were there last month on Honeymoon…its such a wonderful place..we really loved it and wish to go there again & again…for honeymoon in india we recommend mussorrie..
Mussoorie is truly THE QUEEN OF THE HILL STATIONS. I was there for 7 years at St. George’s College and memories of 60 odd years ago are still fresh in my memory. My father studied at Wynberg-Allen school until 1946 with Lockie. My family went to see his old school and Mussoorie and the surroundign areas are very beautiful indeed. I feel however that it will become over commercialised in the future as there is an incredible amount of building work going on. I hope anything that is built is sympathetic with the older style buildings. Definitely worth a visit though….. Awesome pics.. Its the most beautiful place to be on earth anytime.. The photo of Mussoorie after a hailstorm is mine and has been copied off the flickr website and published on this website without my permission. Not only that, it has been tagged with the title of this website, thus claiming ownership. I was 2 years old when I was taken to live in Mussoorie, and left for England when I was 21 years. I schooled there and also taught there before leaving. My memories of Mussoorie are very beautiful. I shall always remember the happy times I had there. I was born in Mussoorie in my childhood and used to live there till I moved to UK in 1972. My late Father Lt Col Michael.A.R. Skinner and family used lives in Midstream, but Midstream home is gone now!! I always have fond memories of Mussoorie all my life!! One day I may go there again for the holiday!! Many thanks for the fabulous photos which brought back my memeories!! 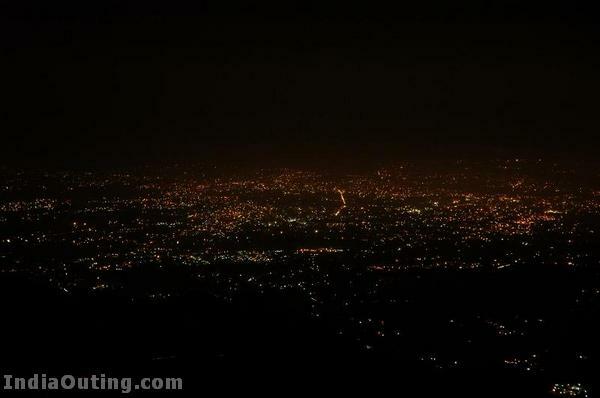 Wow…………..I will definitely visit there when I will go to mussoorie next time. I went there in Jan. The freezing cold climate was an awsome experience. Its a dream place. You will feel at home in the town. The mall road is vibrant and full of life. One can stroll from the library end of the mall road to the Gandhi Chowk (around 1.5 k m) to feel the essence and vibrance of this beautiful place. Lot of options are available for delicious food like Udupi, Gujrati Food at Padmavati Palace, South Indian Food at Sagar Ratna… the list is very long. Wake up in the morning, put on ur track suit and try a walk towards the company garden which is around 5kms from the mall road. You will never forget the experience. Try it…………. i went massoorie one times , it was amazing experience .